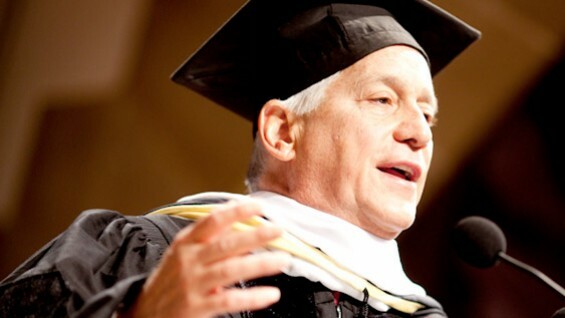 Walter S. Isaacson was Cooper Union's 2012 Commencement Speaker. Below you'll find a transcript of his speech. This is the highest honor that can be bestowed by institutions of higher education. This year we’re proud to award an honorary doctorate in humane letters to Walter Isaacson. Will Walter Isaacson and chairman Epstein please come forward. Walter Isaacson, you are an acclaimed biographer, journalist, editor, and leader. Your tenure as the fourteenth editor for Time Magazine, and as the CEO of CNN occurred during a period of enormous technological change in media. You anticipated the movement to new media, garnering substantial acclaim for your leadership. As President and CEO of the Aspen Institute you have continued your efforts to create a better future for our society. Fostering enlightened leadership and opened minded dialogue around the world. A Rhodes scholar and three-time Overseas Press Club award winner, you are the author of several of the most highly acclaimed biographies of our time, including the one I read over the holidays, Steve Jobs, in addition to, Einstein: His Life and Universe, Benjamin Franklin: An American Life, and Kissinger: A Biography. As well as co-author of The Wise Men: Six Friends, and the World They Made. Among your many leadership positions, you’re a trustee of Tulane University and member of the Board of Overseers at Harvard University. As chairman of the Board of Teach For America, you helped create access to education for thousands of young people across this country. A native of New Orleans, you served as Vice Chairman of the Louisiana Recovery Authority following the devastating Hurricane Katrina. From 2010-2012 you were appointed by President Obama to serve as Chairman of the Broadcasting Board of Governors. You are the recipient of numerous awards, including the Quill Award for your biography of Albert Einstein and most recently the Carl Sandberg Literary Award from the Chicago Public Library. Through your successful decades-long career as a dedicated journalist and award-winning author you understand well the importance of freedom of expression to the cause of democracy and human rights. Walter Isaacson, with the approval of the Board of Trustees of the Cooper Union for the Advancement of Science and Art, and by virtue of the authority vested in me by the State of New York, I am pleased and honored to confer upon you the Degree of Doctor of Humane Letters, Honoris Causa, and admit you to all of the rights and privileges pertaining thereto. We now invest you with the hood signifying this degree. Congratulations. And now allow me to present our commencement speaker. Thank you very much Mr. President. As a biographer of Steve Jobs, I can say without qualification that this magical institution is not only a place he would love, it’s a type of place he would have founded. It means a lot to me to be in such a magical place and to be so honored with such a great degree. The reason this place is so magical is it did what all of the subjects I have written about have done, but Steve Jobs in particular, which is, understanding the connection between art and technology, between beauty and engineering, between design and the sciences. He understood that that is where value will be created in the 21st century and all of you have had that magical experience of being in a place where all sorts of people, from all sorts of backgrounds, people like a Steve Jobs who was the son of a high school dropout and auto mechanic could be at a place that understands how to stand at that intersection between beauty and technology. When Steve Jobs called me in 2004 and asked me to do his biography, I had done Benjamin Franklin, just finished Albert Einstein and he said, “Well why don’t you do me next?” I did think humility was not one of his strongest virtues. But after a while I realized he was battling cancer and that his life had that theme. Because in our very first long interview, he said, “When I was a kid I loved beauty, I loved arts, I considered myself a humanities kid, I loved calligraphy, and fonts. But I was also an electronic geek, I loved engineering.“ And then I read something that Edwin Land, the inventor of Polaroid said, which is, if you stand at that intersection of technology and beauty you will be able to contribute more to the world than anybody else. And that’s why Steve Jobs took that notion of calligraphy that he loved and goes to Xerox Park, one of the great engineering institutes of the time, figures out bitmapping—how you bit map a pixel to part of a microprocessor—and creates the whole desktop publishing industry. And all the way through his career, as I thought about it as I was thinking about writing this book, you see somebody who transforms industry by that connection of beauty and technology. Whether it’s bringing the computer home with the Macintosh, the first real personal computer, or the music industry, or cell phones or publishing, an iPad, digital animation, even retail stores—all of it is that notion that arts and the sciences connect. And at every one of his product launches, you can go back at YouTube and look at them, at the very end after he has unveiled the product, a screen flashes on behind him and its just two street signs: the intersection of the arts and the sciences street. And he said that’s what we have in our DNA and that’s why we produce these types of products. All three of my heroes, Franklin, Einstein, and Jobs, I think felt that way and when I first started writing about Benjamin Franklin, I thought of him as a writer, a humanities type, somebody interested in governance. I did realize that he was probably the most important experimental scientist of his time. Both with the electricity experiment and so many of his other inventions. And I realize that a Benjamin Franklin or a Thomas Jefferson would have thought people philistines if they didn’t appreciate the beauty of science. And likewise, Albert Einstein, a great scientist would have thought people philistines if they were scientists and didn’t appreciate the beauty of Goethe or Mozart, or all of the literature or music that he loved. So today, I’m going to take a page from Steve Jobs’ book when he gave the only commencement speech he ever gave and said, “I’m just going to talk about three lessons, just three lessons,” and my three lessons will be one from each of the people I have written about. The first of these three lessons is about Steve Jobs and having a passion for product. Because in this day and age we all too often see people in business or technology with a passion for making a profit but who lose sight of the fact that they should have a passion for making a great product. Jobs always said that if you make a great product, the profits will follow, but if you focus on making profits, you’ll end up cutting corners when it comes to making your products. And you see that from the very beginning when his father was building a fence around the backyard of their house when Steve was only seven years old, his father said to him we have to make the back of the fence just as beautiful as the front of the fence. And Steve walked around, he showed me the fence, we took a walk in his old neighborhood and he made me look at the back. Steve said to his father, “But why? Nobody will ever see it, nobody will ever know.” His father said “Yes, but you will know.” Great artists care about the parts unseen. And throughout his life, he had that passion for making a great product, sometimes a passion that drove people to do things they thought were impossible. His colleagues called it “the reality distortion field.” Actually, they had worse names for it at times. But what it was, it started even when he and Steve Wozniak were working the night shift at Atari and they had to do a game called Breakout. Woz said, “That’ll take me about five weeks to do the coding.” And they were working on an apple farm, hence the name of the company they eventually founded. And Steve said, “We have to get to the apple farm this weekend to do the harvest, you have to code this in four days. And Woz said, “That’s impossible, I can’t code it in four days.” Steve had taught himself to stare without blinking and he stares at Woz and says, “Don’t be afraid, you can do it.” Woz said it was so baffling but he stayed up four nights and ended up finishing the entire Breakout game in that period. Over and over again Steve does that, even with original Macintosh. When it took it seventy seconds to boot up, when it was nearing completion, it was almost as bad as a Microsoft machine it took so long to boot up. And so Steve said to the engineer, Larry Kenyon, in charge of the boot up sequence, “You have to shave ten seconds off.” And Kenyon said, “I can’t, this is really elegant coding.” Steve said, “If you could save a human life would you take ten seconds off?” And Kenyon said, “Well, of course.” And Steve went to a board and said, “There will be a million Macs all next year, they will be booted up a couple times each week. Do the math. If you can save ten seconds off the boot up time, you will save the equivalent of one hundred and thirty lifetimes, every year.” Kenyon went back to his cubicle and after a few weeks, saved 28 seconds off the boot up time. Jobs even did this when he was creating the iPhone and didn’t want to have junky plastic on it. He wanted it to be tough, smooth glass. The Chinese that were making the glass at the stores couldn’t do the glass well enough and so he called up Corning and the guy who runs Corning, Wendell Weeks. Steve explained the type of glass he needed. Weeks said, “We once created something called gorilla glass but we never manufactured it.” And he explained the formula, the ion transfer process, all that would make it a really strong, smooth, silky glass. And Jobs said, “That’s it, that’s what I need and I need this much by September because we’re shipping the phone in October.” Weeks said, “No, I told you we don’t manufacture it, we don’t have a plant that makes it, we can’t do it.” Weeks told me it was astonishing—this is by the way, thirty years to the day since he did it to Woz—he said: “This guy is sitting there and he’s staring at me, not blinking, and says, “Don’t be afraid, you can do it.” After Steve left, Weeks picks up a phone, calls a plant in Harrodsberg, Kentucky, that was a Corning plant where Weeks trusted the manager and said, “I want you to shift over to gorilla glass and I want you to do it tomorrow.” And the plant manager said, “we don’t have the process down, we can’t do it.” Weeks told him, “Ddon’t be afraid, you can do it.” The obvious upshot is that nine months later, that small plant near Lexington, Kentucky had made all the glass needed for all the iPhones. When you pull out your iPhone this afternoon or your iPad, every piece of glass on every iPhone and iPad is made by Corning because of Steve’s passion for product and his reality distortion field. Einstein also had this passion for product and simplicity. Steve Jobs once sort of said that simplicity is the ultimate sophistication. Einstein’s line was that any damn fool can make a problem more complicated, but it takes a genius to make it more simple. When they were doing the iPod for example, Steve said, “Make it simpler, 3 clicks, any song, a thousand songs.” He got mad every time there was some interface design that you needed some instructions for, you couldn’t figure out what to do. Finally when they had it almost perfect, Steve looked at it and admired the beautiful design of the original iPod and said, “What’s this?” A little scared to answer him, but finally Tony Fadell, the engineer said, “Steve that’s the on/off switch.” And Steve said, “What does it do?” They pause for a second, because they know he knows what it does. And Fadell says, “it turns it on and off.” And Steve says, “Why do we need it?” And it slowly dawns on them, you don’t need a big on/off switch on the original iPod. When you quit using it, it powers down; when you start using it again, it powers back up. Keep it very simple. That was Einstein’s passion as well. Everything he did was a crest for simplicity and the harmony of the laws of the universe. But he also had, his main passion to me, was a passion for curiosity. Now I remember what was causing my palms to sweat when I was in New Orleans when I was seventeen, and it was not Maxwell’s equations. But it’s that passion for curiosity that caused him—when he could not get a job at a university or as a teacher, only as a third-class clerk in a Swiss patent office looking at the patent applications for synchronizing clocks—to realize that somebody in motion will see a clock that is synchronized differently than a person who is in a different state of motion. So he questions the ultimate statement we have at Newton’s Principia that time marches along second by second, irrespective of how we observe it. He said, “How do we know that?” There’s no way to know that, and he comes up with the theory that if you’re moving, the speed of light remains constant, but time is relative. It’s just that simple and imagine that came from a passion for curiosity. Franklin too had a passion for curiosity when he was a runaway at 17. He was going across the ocean to get printer’s fonts because he wanted to be a printer. And he notices, he’s been told, that the ships go faster towards Europe than coming back. Winds don’t explain it, the rotation of the Earth doesn’t, and he’s lowering the barrels and buckets into the ocean because he has this theory that he heard from some captain, said there’s a gulf stream and he’s the first person to discover it, to plot it, to map it. But his passion for curiosity was not the strongest passion, it’s not the lesson of passion I would take from Ben Franklin. Instead, his passion was in some ways, the ability to overcome some types of passion and to believe in tolerance. That was something unique in America at that period, that you have religious, ethnic, social, and community tolerance. For letting passions cool, for respecting others. You see it when he is appointed to a committee with Thomas Jefferson and John Adams, to write the Declaration, probably the last time congress appointed a good committee but you know, they’re doing that famous second sentence. And there’s Jefferson’s first draft that said we hold these truths to be sacred. Franklin’s printers pen on the first draft: “We hold these truths to be self evident,” because he’s saying our rights come from the consent of the governed and rationality of reason and not from the dogmas of religion. But the sentence goes on that we are endowed with certain inalienable rights. You see John Adams’ pen was endowed by their creator and so you see even in the editing in one half of one sentence the notion of tolerance, of balance, of listening to other people, of trying to do what Rabbi Jaech said, which is that those things that unite us are stronger than those things that divide us. Sometimes our body politic needs to remember, today, is when religion used to divide us rather than to unite us. Even at the constitutional convention when they have the big state/ little state issue problem, it’s Franklin after the Connecticut Compromise is going down in flames that gets up and says, “Let’s have a Senate and a House, Senate for the little states, House for the big states for proportional representation.” He said, “When we were young tradesmen here in Philadelphia and we had a joint that wouldn’t fit together you would have to take a little from one side and a little from another until you had a joint that would hold together for centuries. Here too at this constitutional convention we have to each part with some of our demands.” His point was that compromisers may not seem to be the great men of passion, compromisers may not be great heroes, but compromisers do make great democracies. They do make great communities, and that’s part of the lesson too, of his passion. When I was graduating from college, the minster at the memorial church at my college had a great sermon and it was called, “What we forgot to tell you.” And what we forgot to tell you, he said, is that it isn’t all about you, it’s about something a bit larger. It’s about your community, your country, your world, about this universe we live in. It’s about whatever spirit you believe motivates this universe. I do think that Ben Franklin fully understood that. He was always creating collaborative cooperative projects to serve his fellow citizens. During his lifetime he donated to the building fund of each and every church built in Philadelphia and at one point they were building a new hall. If you go to Philadelphia and you look at Independence Hall, that red brick building to the left, it’s still called The New Hall. He wrote the fundraising document, and even if the Mufti of Constantinople would send someone here to preach Islam to us and teach us about Muhammad, we should offer them a pulpit and listen, for we might learn. On his deathbed, he was the largest individual contributor to the Mikveh Israel synagogue, the first synagogue built in Israel, and so when he died, instead of his minister accompanying his casket to the grave, all thirty five ministers, preachers and priests of Philadelphia marched with him to the grave. And as for Einstein, when he got sick and he was hemorrhaging, and brought to Princeton hospital he declined having an operation, he knew he had only a few days to live, but he asked that his papers be brought to him. I went to Hebrew University because I just wanted to see, because it’s page after page of mathematical equations, some little mistakes crossed out doing it, but he’s still doing line after line of equations, trying to figure out why that needle twitches and points North, the unified field theory of this universe. He said that all he was doing was trying to get us one step closer, just a tiny step closer to the spirit that’s manifest in the laws of the universe, because he understood the connection between beauty and the laws of the universe. As for Steve Jobs, about a year ago, when he started getting really sick and I was out there in Palo Alto, we spent some time talking about what was the purpose, what was the mission. Here’s a guy who had a passion for product, he wasn’t a guy who had that civic engaged the way Franklin or Einstein had, but he said just what I tried to convey today. That when he went through life he realized that life is a journey, that the journey is a reward and that as you go through life you are able to take things out of history that people before you had contributed. And you benefit from them, such as Cooper Union, such as any institution created that allows you to benefit, any product, the ability to get food, clothing and how it all works . That comes from great people who put things in the flow of history and the important thing for you is to put something back into the flow of history, to contribute to that flow of history. And Steve said that’s what he felt his mission had been. And I asked him if he’s still spiritual, “has your Buddhist class caused you to believe that even after you die your spirit lives on?” He said, “Yes, I like to think that, I like to think that all the experiential wisdom, all the work we did, all the things that we’re passionate about doing somehow all lives on and so too your spirit lives on somehow or another. “ And then he paused for a moment, because Steve being Steve, he was always a bit abrasive, and he said, “Yeah, but sometimes I worry that it’s just like an on/off switch, you die and, click, you’re gone.” I was kind of quiet as you might expect. And then he gave me that half smile and said, “Maybe that’s why I didn’t like to put on/off switches on Apple devices. I think all three of them give you that lesson: that it’s important to know what your passions are, but it’s also important to channel those passions to a higher purpose. Good luck and Godspeed.